DVD to iMovie - How to Import DVD to iMovie? iMovie (including iMoive '08/'09/'11) just supports MPEG-2, DV, HDV, QuickTime Movie and MPEG-4. In order to import DVD to iMovie, we will need to convert your DVD disc to one of the above video format (MPEG-4 is recommended). 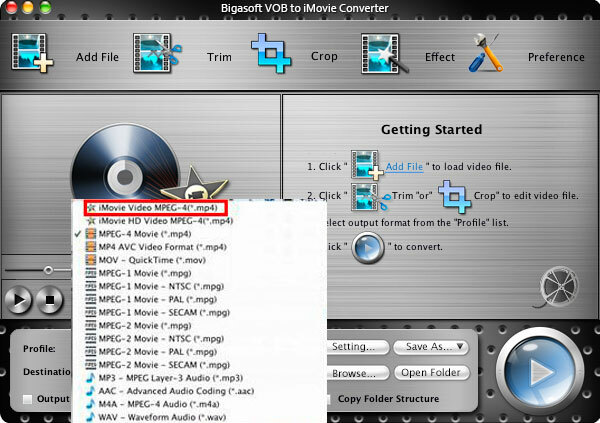 The article will guide you step by step to convert DVDs to iMovie video MPEG-4, convert only a DVD segment/clip or convert a DVD chapter to iMovie, with customize footage and customize size. Then you can freely import DVD to iMovie '08, iMovie '09, '11, iMovie HD. 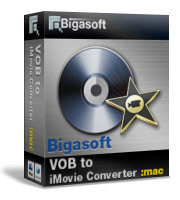 Bigasoft VOB to iMovie Converter is an ideal VOB converter which helps to fast convert DVD discs to iMovie videos and audios with high quality such as MPEG 4 video (.mp4), iMovie HD Video MPEG4 (.mp4), MPEG-2 video (.mpg), QuickTime MOV, MP3, AAC, M4A and WAV. So you can freely import DVD to iMovie for enhancing of your video. It can also convert DVD to video for play on your iPad, iPhone, Apple TV and so on. 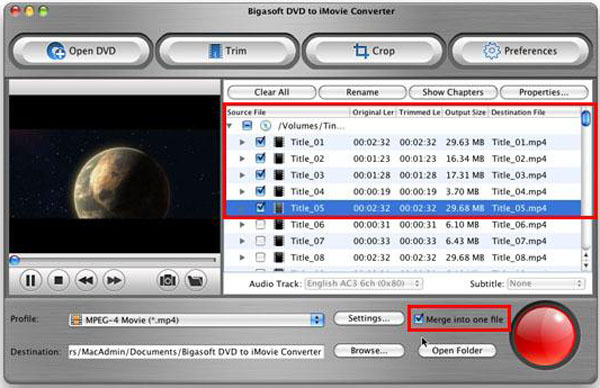 You may preview the movies before conversion, trim to convert a DVD clip or segment, crop black margin, automatically turn off after long conversion, merge DVD chapters, select audio track and subtitle you preferred, adjust the parameters to customize output effect. 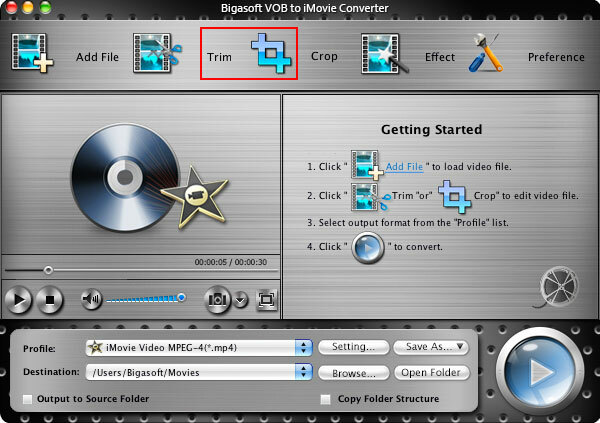 Step 1 Free Download DVD to iMovie Converter and Launch it. 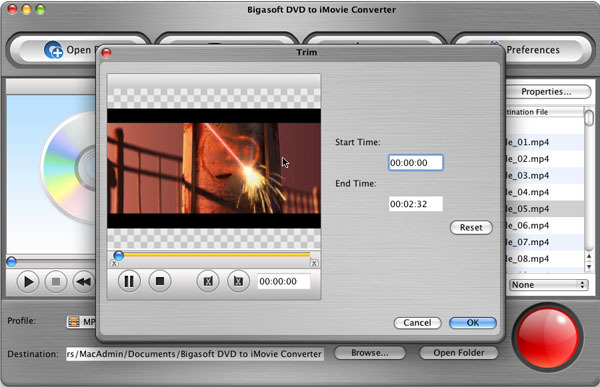 Free download the professional DVD to iMovie Converter for Mac, install and launch it. The following is the main interface of the software. Insert DVD disc to your Mac DVD-Rom, then click "Open DVD" button to load the DVD files. Click the down list button on the right side of the "Profile" button to set the output format. You can click the "Settings" button to set parameters of your output video effect such as Frame Rate, Video Codec ,Resolution and Video Bitrates, etc. Specify the destination folder. Click "Convert" button and let the DVD to iMovie Converter to convert DVD to iMovie MPEG-4. By setting Start time and End time of the video with the "Trim" function you can custom file size or custom DVD clips for conversion. By using "Crop" function you can cut off the black edges or adjust the playing region of the original movie video to fit for your favor. "Settings" function allows you to set parameters of the output files such as frame rate, resolution, channels, sample rate, video /audio codec, video/audio bitrates, etc. Now you can find the converted DVD movies from the destination folder and drag and drop it to iMovie (including iMoive '08/'09/'11) project area to edit as you wish. Import DVD to iMovie is just so easy with the help of Bigasoft VOB to iMovie Converter.